For medieval people beauty in art was certainly an important consideration, and something that they had an eye for. But beauty did not form the essence, the meaning and purpose of a work of art. Medieval people’s primary concern was with the content, which was to be found in the theme or subject – subjects such as Jesus’ Baptism; the Suffering of Christ; the life of a certain Saint, etc. We also learned that we should not understand this to mean that the theme, which could be expressed in words, was their only concern. Rather, it was also very important how the theme was portrayed. For the manner in which the theme was represented, the composition, contained an element of exegesis, of interpretation, of explaining the meaning of the theme, and this was not to be neglected. We use the term ‘formula’ for this, partly because certain compositional schemes reappear again and again, and medieval artists certainly did not try to come up with a new way of expressing the theme each time. That would have contradicted their intentions. We gave several examples of this, but offer two more here. Let us compare two Madonnas, both sculpted as Sedes Sapientiae: Mary as the seat of Wisdom, in which her high position and her importance in the story of salvation, in a religious sense at least, are clearly portrayed. Our two examples are thematically alike. Both are Madonnas, both are created according to the same formula (we expressed that with the name Sedes Sapientiae, which indicates that the content of these two Madonnas is the same because of the corresponding formula); but stylistically they are very different. The one is Romanesque, while the other is Gothic. Though if we would look carefully, we would notice that even the way in which the garments fall shows great similarity. The stylistic difference, however, does not result in a difference of content. There are other Madonna-types as well. For example, in the fourteenth century in Italy the Madonna del’ Umilità emerged, the humble Madonna, who was usually presented in a formula whereby the Madonna sat on the ground on a cushion, and seemed to relate to the Child in a more motherly way. In summary, we could say that when the formula changes, there is a corresponding change in content, in the meaning of the artwork. The fifteenth century was a period that saw incredible changes. When we think of Italy we speak of the Renaissance; with regard to the North we speak of the Flemish Primitives (a ridiculous name, by the way) or of late Gothic art. Fundamentally, however, there is not much difference between the North and the South. The most striking distinction is that people in Italy, or, more specifically, in Florence, were stylistically inspired by the art of antiquity (Roman art, in other words). Those in the North discovered new elements through direct visual observation and introduced them into their art. On both sides of the Alps though, there was a strong interest in humanity and their surroundings, in the natural givens – in addition to the supernatural realities of the Christian religion, which belonged to the established tradition. How were these two elements expressed in art? When we consider two examples of the Baptism of Christ, one from the twelfth century and one from the fifteenth century, we see that with respect to the formula there is hardly any difference, even though nearly four hundred years passed between the creation of the earlier piece and the time the second one was made. We could just as well have chosen an Italian example, because in this respect there is little difference between the art in the north or the south of Europe. For example, we could have chosen Piero della Francesca’s Baptism which hangs in the National Gallery in London. When viewing the twelfth- and fifteenth-century pieces which both portray Christ’s baptism in the River Jordan, we would notice not only a similarity in formula but also some striking differences. The twelfth-century Baptism is rather sober and offers only the bare minimum. There is hardly any landscape, and even the water is symbolized more than depicted as a little ‘mound of water’ in which Christ stands. 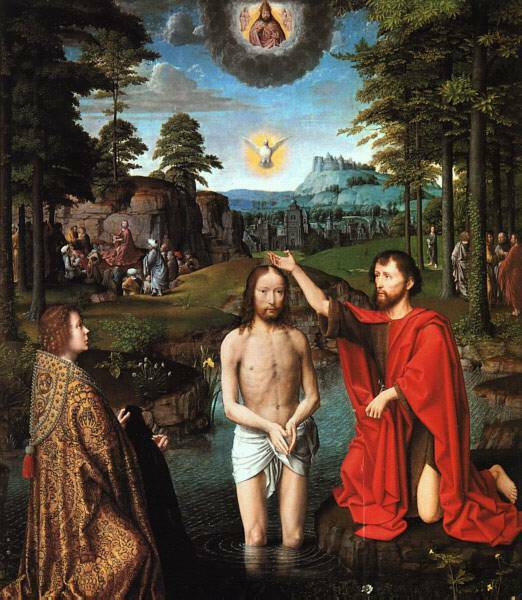 There is much more to see in the Baptism of Gerard David. The wonderful cappa (cape) of the left angel, made of heavy brocade, is a treasure in itself; the ripples in the water are depicted in a sublime fashion; behind Christ the river continues to flow through a spacious landscape in which there is much to see – trees, mountains, and much more. It is clear that these features on which we are now focusing have nothing to do with the baptism of the Lord Jesus, but neither could we say that they are unimportant. They form, as it were, a second-level content of the artwork, next to the religious one. Nature has been carefully observed, and its representation is certainly one of the essential elements of the painting. Incidentally, we should mention that this representation of natural elements – landscape, the spaciousness, the people in their threedimensional forms – had a peculiar consequence. For it made it almost impossible to meaningfully depict saints with halos around their heads, since they would have looked more like golden plates suspended in the air behind the heads of these figures. That would have looked rather strange! And this shows clearly what a profound difference there is between the depiction of the Baptism from the time around 1100 and the one from the year 1508; in the first, the halos do not jar us because the whole painting is symbolic – or iconic – a representation of a supernatural event in which things like landscape have no real relevance and are left out without our even noticing it. In the Flemish work, on the other hand, we see that besides the event of the Baptism which, as such, reality of nature, and this reality has its own importance in terms of the content. Yes, we would have to say that in the piece by Gerard David there are two contents side by side: the supernatural event of the Baptism and the natural reality of the landscape, the space, the clothing, etc. This is a typical feature of fifteenth-century art: there is a discrepancy as two contents stand next to each other, while they do not correspond with each together and each have their own meaning. This makes it possible for modern viewers to look at the painting by David and simply forget that the painting is about the Baptism, as they would focus their attention on one facet of the work only. That would be impossible with the work from AD 1118, because if we would not notice that this piece is about the Baptism then there would be nothing left, however beautiful the gestures of the figures are and however superb in quality. This discrepancy, this inner contradiction, began with the work of Jan van Eyck and some of his contemporaries, and with the work of the sculptor Claus Sluter from a generation earlier. In Italy, this inner contradiction was also very clear. Especially in Florence, where painters like Botticelli and others sometimes took it to extremes. For example, when they depicted a Madonna, they held themselves strictly to the old formulas, but in reality they were painting a portrait of a sweet Florentine girl. And in the Adoration of the Magi there is so much to see – ruins, people in gorgeous clothing, and so on – that we almost forget the actual religious content rendered in a time-honoured style. Jan van Eyck tried to solve this contradiction by ensuring that every ‘natural’ element in the painting also had a meaning with respect to the theme – namely, a symbolic one. The problem remained, however, since it is often hard to make out when the symbolic ends and the purely natural begins. One might respond that, in principle, there should not be an end (to the symbolic). But even then, it is a solution that only makes the inner contradiction sharper and more distinct (and at the same time more complicated and more compelling). It is interesting to see how a high-church painter like Rogier van der Weyden sometimes reacted to van Eyck’s work and attempted to make his own work less strongly ‘natural’ besides the religious content. The tension in this art, in which the conflict of the entire Florentine early-Renaissance culture came to expression, would inevitably lead to a short-circuiting, and consequently to a solution. This occurred in the person of Savonarola, the pre-Reformational figure who called the Florentines back to the true faith and specifically satirized the art which, under the guise of religion, was in actual fact an expression of complete worldliness; it was art whose real content offered something quite different from what it purported to offer. Botticelli himself was one of the first to sacrifice his own work up to the flames. The art he created after that time demonstrated quite a different spirit: it emphatically brought to the fore, quite strictly and directly, the old formulas and reduced the inner contradictions to a minimum. It was, however, up to Raphael and a number of his contemporaries – for example Fra Bartolommeo, who was also strongly affected by Savonarola – to find a definitive solution for the problem posed by the fifteenth century. ‘Form and Content of Modern Art’.